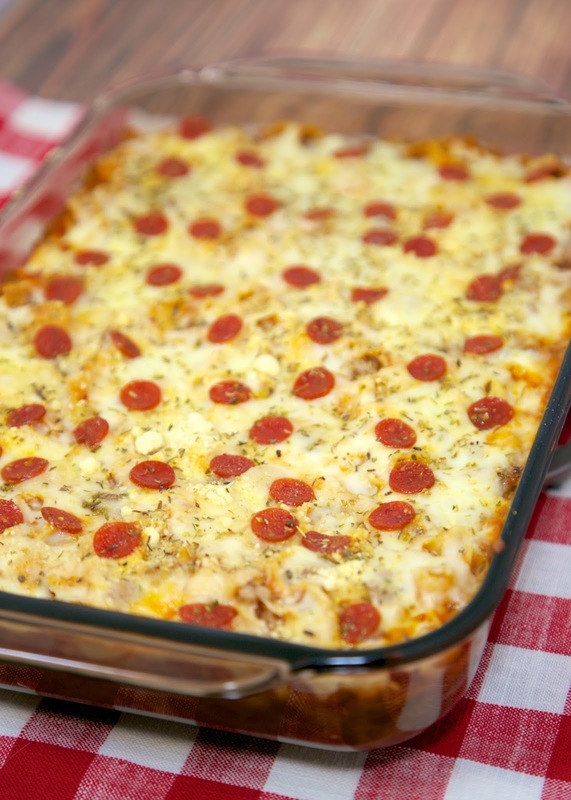 Pizza Pasta Bake - cheesy pasta bake with pizza sauce and your favorite pizza toppings! Hamburger or sausage, egg noodles, cheese soup, mozzarella cheese, parmesan cheese and pepperoni. Great weeknight meal! Kid-friendly and a good freezer meal! 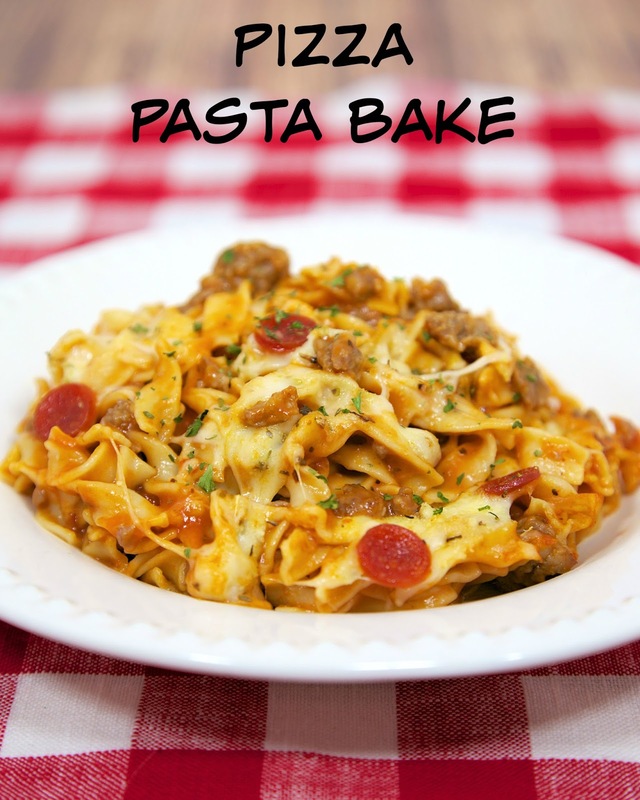 We love this easy pasta casserole recipe! I am a big fan of pasta casseroles and pizza. When I ran across this recipe, I knew I would love it! This was so simple to make. I cooked the meat while the noodles were boiling and just tossed it together. It took about 30 minutes from start to table. This would be a great casserole to make ahead of time and refrigerate for a few days to eat later in the week. I used sausage and pepperoni in this casserole, but feel free to add peppers, onions or even mushrooms. You can really play with the meat and veggies in this casserole. We ate this for dinner and lunch the next day. It really reheated well. I would definitely make this again! Cook egg noodles according to package direction. Drain and set aside. Cook sausage or hamburger in a large skillet over medium-high heat until no longer pink. Drain fat. In a large bowl, combine cooked sausage, soup, pizza sauce and cooked noodles. Stir until combined. Transfer mixture to a lightly greased 9x13-inch pan. Top with mozzarella cheese, grated parmesan and chopped pepperoni. Bake for 20-25 minutes, until bubbly and cheese is melted. This sounds easy, simple and good! Thanks for posting......I'm making this tonight! You make some of the most delicious looking baked dishes. Do you think Campbell's Fiesta Nacho Cheese soup would be a harmless substitution? And do you use your own pizza sauce? Thank you! I think the Fiesta Nacho Cheese soup would be fine. I did not use my own pizza sauce. I had some Trader Joe's pizza sauce in the pantry that I used in this casserole. Homemade would be great though! This is a keeper! So easy and the whole family loved it! Great recipe. Its a keeper. Used turkey pepperoni on top. My hubby, 8 yo and 2 1/2 yo loved it. New recipe to add to the rotation. This pasta bake was delicious. I used mild Italian ground sausage. Such simple ingredients come together to make such a delicious comforting and kid pleasing dinner. I absolutely LOVE those little baby pepperoni, they're so cute! Served it with garlic bread and had a happy troop at the dinner table!